You are at:Home»Basketball»Will Russia close the Carrier Classic Gap? Despite recent reports, the U.S. remains ahead of the Russians when it comes to the next generation of naval warfare — namely, hosting sporting events on aircraft carriers. English-language all-Russian-news site RT.com reported Monday that the Major Hockey League, which is actually a minor hockey league (those wacky Russians) to the big-time KHL, is planning to hold a game on a flattop anchored in the Gulf of Finland. The host team would be HC VMS St. Petersburg, the Russian navy’s official hockey club, according to the report. No date is set, no opponent is named, and there’s no word on whether Russian President Vladimir Putin will attend … or participate. A league spokesman told the Indo-Asian news service he’d never heard of the Quicken Loans Carrier Classic, the college hoops game played on the aircraft carrier Carl Vinson last year; he’s either not being completely truthful, isn’t a regular After Action reader or is still angry about being turned down for a mortgage. 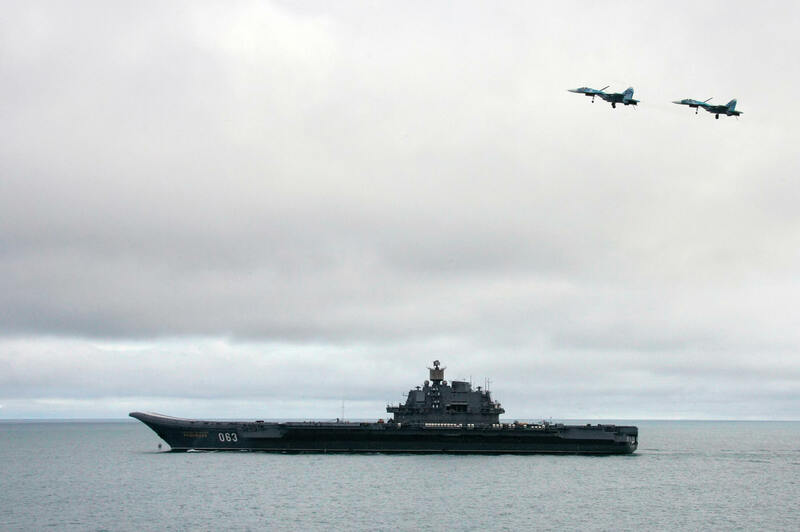 How will the U.S. respond to this Russian foray into the at-sea sports world? With Ohio State, of course: The Columbus Dispatch reported Saturday that the Buckeyes will send two basketball teams to the decommissioned carrier Yorktown in Charleston, S.C., on Nov. 9 to compete in the second Carrier Classic — the women’s team will face Notre Dame and the men will battle Marquette. The Buckeyes will take over for Connecticut in the men’s game, according to the report, after the Huskies could not reach a final agreement with event organizers. An official announcement is likely for June and the games will be on ESPN, according to the Dispatch. West Coast hoops-on-a-carrier fans can get their fix that same day, with San Diego State facing Syracuse on the deck of the decommissioned carrier Midway. And Michigan State, which lost to North Carolina in the inaugural Carrier Classic, is already angling for a 2013 game against Notre Dame on an active flattop in Florida. That’s some high-quality college hoops firepower. Your move, Moscow.